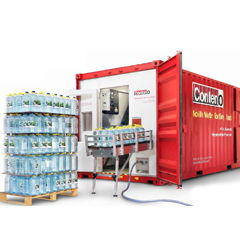 ContenO is a designer and manufacturer of Mobile Water Plants, as complete factories, build in ISO containers or on trailers, such as packaging and processing plants for liquid products. ContenO provides solutions to Peacekeeping, Human Aid organisations, Army, Civil Defence, and Commercial Customers. The availability of reliable potable water is one if not the most important resource in terms of military support in theatre. The starting choice is for local production and distribution on the spot rather than long distance transportation and distribution. This choice is just a matter of best practice logistics, the cornerstone of any reliable water supply solution. 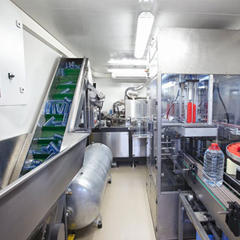 In terms of reliability and security of moving assets, mobile water bottling plants from ContenO offer a number of clear ‘best practice’ advantages. Safety and simplicity of logistics through short and direct supply lines, limiting vulnerability to hostile activity considerable. Strongly improved logistics operation in terms of personnel, storage, fuel, trucks, transportation and overall costs. 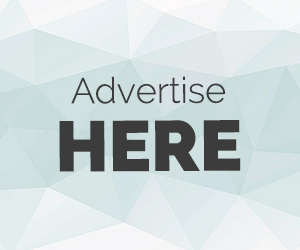 Up to 80% saving on total logistic chain. One truck filled with small PET preforms corresponds to the equivalent of twenty trucks of bottled water! 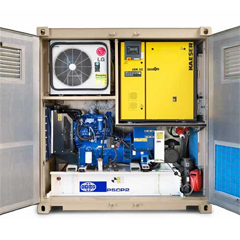 Packed in standard 20ft or 40ft ISO containers, the mini factories are self sufficient with an onboard generator, compressor and Air-conditioning unit, and meet the International Food and Beverage standards. 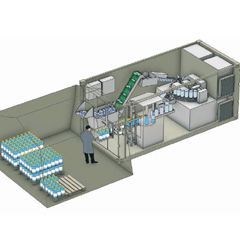 End-to-end production automation: In the system PET preforms are being heated and blown into perfect bottles, filled and capped in sterile conditions and labelled without human intervention. The factory is highly mobile (in container, on a skid or on trailer), operational in less than one hour and requiring one operator only. Reduced ecological footprint. Light and durable PET performs are easy to transport, shred and recycled locally. Flexibility in packaging choices. Depending on the specific purpose and application, the solution supplies recyclable PET bottles (0.2 to 10 litres), alternatively pouches, water supply packs to fill camelbacks. Containerised bottling plant, purification capability RO, inflatable tank for raw water or purified water storage, dedicated special design tent allowing sterile working conditions, submersible pumps and water hoses dedicated for food transport, 4 or 6 pack strapper, wrapper to prepare for bottle palletized transport, shredder to shred empty PET bottles into flakes, cooling container etc. 6 self sufficient and fully automated mobile water packaging plants will reliably produce on site 55,000 bottles or 472,000 litres of potable water daily, in a 20 hours/day shift during 365 days/year and in ambient conditions of 55°C and 85% humidity at sea level. The ContenO mobile bottling plant locally guarantees water supply of the highest quality in an appropriate shape. It meets strict IBWA and FDA regulations as proven during the latest Quartermaster symposium in Fort Lee U.S.A.
On Army grounds, third party inspection CHPPM tested and approved both the operational and water quality. 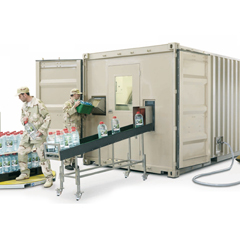 Specific UV-treatment of water, bottles, caps and full automation of transport, filling and sealing eliminate contamination risks by germs, bacteria or fungi. It’s professional, easy to maintain stainless steel construction contains filling and capping in a sterile positive air pressurized cabinet in an insulated and dust free container inner side with walls and ceiling in special easy to clean material. ContenO will demonstrate best practice solutions and full supply chain offerings during the Idex International Defence Exhibition & Conference in Abu Dhabi, February 20 – 24, 2010. ContenO designs and manufactures smart custom made mobile plants to purify, package and process water in bottles in ISO containers, or in pouches in a unit mounted on a skid.